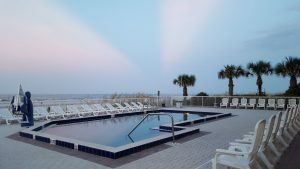 If you are searching the internet for that special family-friendly spot in Florida…YOU’VE FOUND IT! 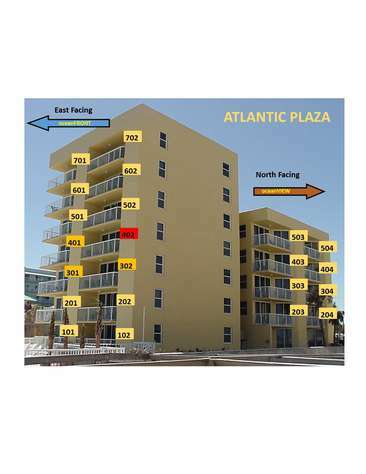 The Atlantic Plaza is a unique 22 unit family-oriented vacation condominium offering daily and weekly rentals year round and monthly rates in the Off-Season and Winter Season. We are within walking distance of Flagler Avenue, the epicenter of the Beach side, which has restaurants, bars, surf shops and quaint boutiques. Click on “Availability” on the BLACK BAR above. Select your arrival date. The Calendar will display all available units starting on the dates of your request. Move the cursor over each available date and the minimum number of nights required to book online and the rates will be displayed. The dates shown in red are unavailable. Click on the square and in the yellow box select the number of nights that you are inquiring about. Only the minimum thru the maximum nights available will be displayed. Select the number of nights and a full quote of the rental will be displayed. Complete the number of guests and you may either email a copy of the quote to yourself or choose to complete the booking on-line. Also, you may exit and check on another unit. Another option is to click on the unit number in the left column where you will be directed to the unit description and pictures. Availability and Booking Calendar for this unit are also available on the page. Click on “Vacation Rentals” on the Black Bar above. Each individual unit is available to view. Scroll down for a complete list. By clicking “Learn More” viewers may access pictures, details about the unit and Availability and Booking Calendars. You may Book under “Check Availability” or “Vacation Rentals”. On-line bookings may be made six (6) months in advance. Only minimum nights stay may be booked or quoted. Guests wanting less than the minimum nights required or reservations further than six (6) months in advance may call us directly at the Atlantic Plaza office. Our front desk is always happy to take your calls. Email or call our office! Error: Error validating access token: Session has expired on Sunday, 24-Mar-19 08:25:15 PDT. The current time is Sunday, 21-Apr-19 16:05:22 PDT.